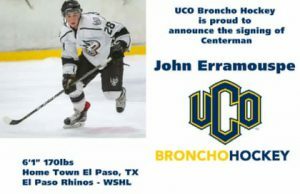 The University of Central Oklahoma Hockey team swept their bedlam rivals from Norman 6-2 Friday night and 2-1 Saturday night. 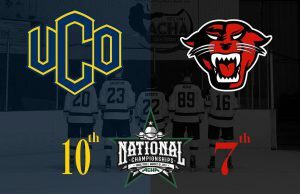 The sweep of the Sooners completed the WCHL schedule for the Bronchos and the final results were in and the UCO Bronchos won their third consecutive WCHL title. 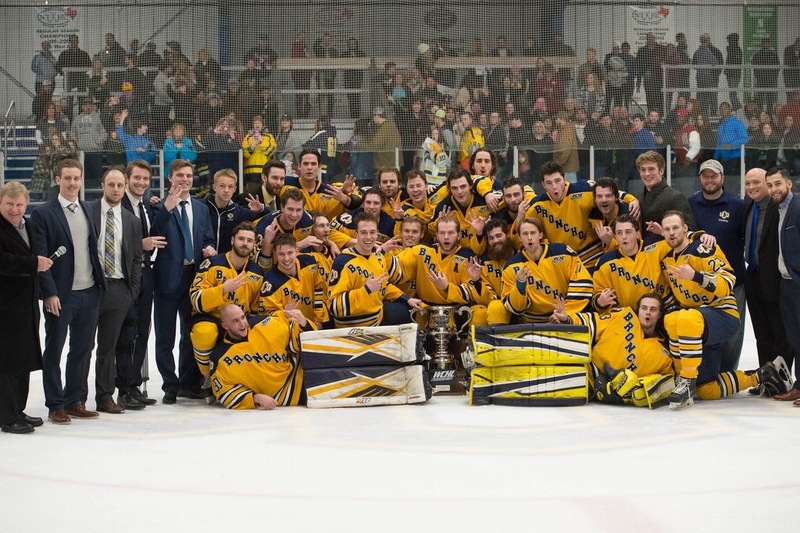 The Bronchos were presented the WCHL Cup on Friday night at Arctic Edge Ice Arena after their victory sparking an on-ice celebration with the fans. 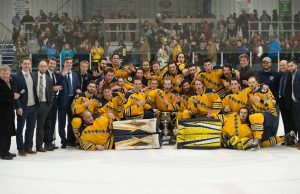 It marked the first time the WCHL Cup was presented on the home ice of the victorious team. 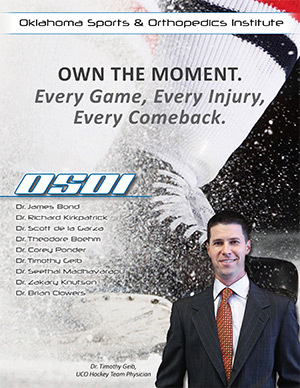 The previous titles were won on the road for both UCO and Arizona State. Friday night the Bronchos went down by two goals early in the first period, but fought back with goals from Landon Robin and Jared Guffey before the first period expired. By the time the second period was over, the Bronchos scored three more goals by Tyler Minx, Nial Mills and Landon Robin. Regan Yew finished off the scoring in the third period for the final score of 6-2. Saturday night on the road in the Oklahoma Sooners rink proved to be a much tighter game as both teams ended the first period scoreless. That changed as UCO got on the board with two Powerplay goals by Gage Joel and Brandon Formosa before the Sooners made it close goal off of a deflected shot. The score remained close as neither team could add to the scoring in a very physical third period. The WCHL champs go on the road to close out the regular season to Robert Morris University in Pennsylvania this weekend. Final rankings for the National Championship Tournament will be released next Monday evening after all the weekend’s games are concluded. 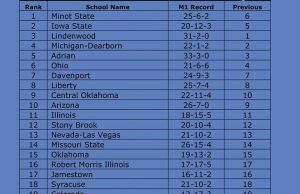 Currently the Bronchos are ranked 5th nationally.